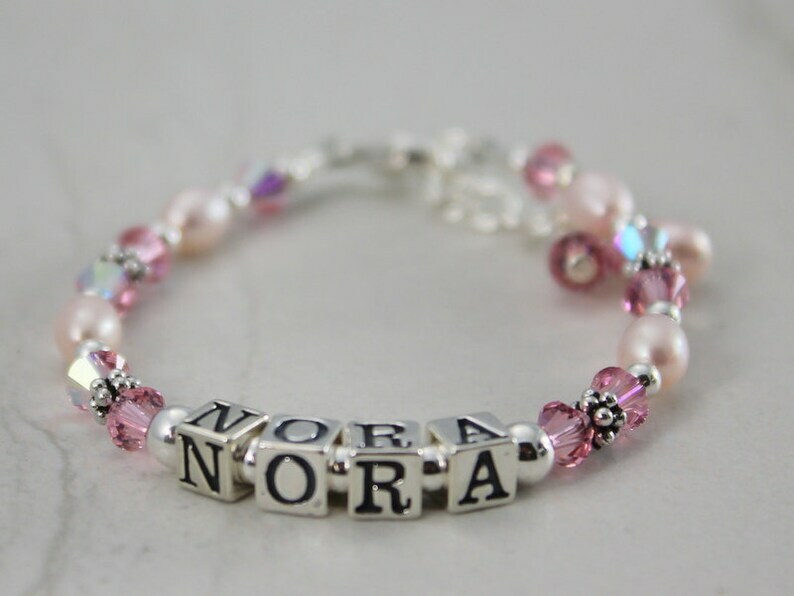 This custom sterling silver name bracelet is so precious just like your little girl. This bracelet is made out of the best quality components, freshwater pearls, swarovski crystals and sterling silver findings. This will be a treasured piece they can hold onto forever. We can do this in pinks, as shown, or in any other color of your choice. We often will make these in birthstone colors. Just message us. The bracelet comes with a 1" extender so you can extend it as your child grows and she can wear it for several years to come. It took a little longer than stated--but the little bracelet is perfect--Just what I expected!! It is beautiful and I cannot wait for my 1st grandchild to get here and be able to wear her new bracelet!!! Thank you so much and God Bless!!!! Absolutely beautiful! I did receive it on time. Super fast delivery. Beautifully made piece of jewelry. Thank you. I love my new bracelet. I did have one problem, I didn’t know what size my wrist was. I then took a tape measure and wrapped it around my wrist in hopes I would get the size I was looking for. I am very happy to say that I did. I do wish the wwjd would have been all more in the center, but I knew how it was when I ordered. I think it is so beautiful and I will be happy wearing it everyday being reminded wwjd in tough situations. Thank you so much and God bless. Unworn items can be returned 1-3 days upon receipt of purchase. All of our items are custom made and we are busy. Please be patient as we get your design "just right". Custom orders ship within a week.